Who is a candidate for cosmetic laser? Yag lasers provide a breakthrough performance to treat a variety of medical and cosmetic conditions including permanent hair reduction for all skin types, leg and facial veins, as well as fine lines, wrinkles, scars, acne and stretch marks. GentleYag is designed to avoid the top layers of skin pigment and has FDA clearance for all skin types. Skin rejuvenation Gentleyag is a laser skin rejuvenation that combats the effects of aging in a softer, gentler way. This revolutionary process delivers laser energy through you skin to gently stimulate the production of collagen. How does the cosmetic laser works? The laser creates a beam of high-intensity light that penetrates deeply into the skin tissue, where it delivers a controlled amount of targeted therapeutic heat. The number of sessions depends on the treatment you require and the condition of the skin. An average of 4-6 treatments may be necessary to obtain the desired results. Your risks are minimal. Redness is the most common and expected for a short period of time. Also there is a possibility of hypo or hyperpigmentation, swelling, blistering and purpura (a laser bruise) in the treated area depending on the type of treatment – these usually do not last more than a few days. Some patients may feel a slight discomfort with each laser pulse, sometimes described as the snapping of a rubber band on the skin. This discomfort resolves in several seconds and is minimized by a cooling device . Many people are embarrassed by the appearance of spider veins on the face or legs. Spider veins are actually dilated or stretched blood vessels that appear on the legs, not “broken” blood vessels, as is commonly thought. Their precise cause is unknown, but it is thought that heredity, excessive standing, weight gain, hormonal changes and pregnancy may be some of the causes. With today’s technology, there’s absolutely no reason why you can’t have smoother, younger looking skin. The laser professionals at our clinic are experts in this area, as well as personal service. The number of treatments vary according to the type and size of the vein. There is typically dramatic improvement with the first treatment. 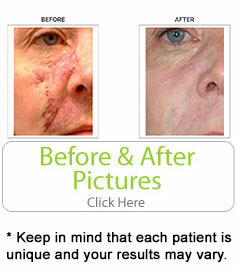 Additional treatments are usually necessary to achieve the complete desired result. Most patients experience minimal discomfort or no pain at all. For sensitive skin patients, a very strong topical anesthetic can be applied to minimize discomfort. This revolutionary advance in vein removal provides immediate results with no lifestyle interruption. Treats both red and blue, facial and leg veins. No needles. No incisions. No downtime. Watch unsightly leg veins vanish today! Spider veins, or telangiectasias, are those tiny purple and red blood vessels found most commonly on the thighs or lower legs of men and women. They usually are hereditary and can form anywhere on the leg, from the top of the thigh to the ankle. Occasionally, spider veins even appear on the face. Varicose veins are larger. They can appear raised with a bluish color and can become quite painful. Although spider veins and varicose veins carry blood, they are not part of the flow of blood that occurs in normal veins. Blood found in varicose and spider veins, flows away from the heart instead of toward it, and ends up collecting in these vessels, ultimately distending them. There are several effective methods for spider vein removal and varicose vein removal. PhotoDerm Vasculight Laser is our preferred procedure for varicose vein removal. Simple, painless laser surgery is used for spider vein removal. Sometimes sclerotherapy (injections of veins) may be necessary in combination with the laser treatments to make sure the larger, deeper underlying “feeder” veins are addressed and to minimize their return in the future.